Select only the best varietals. 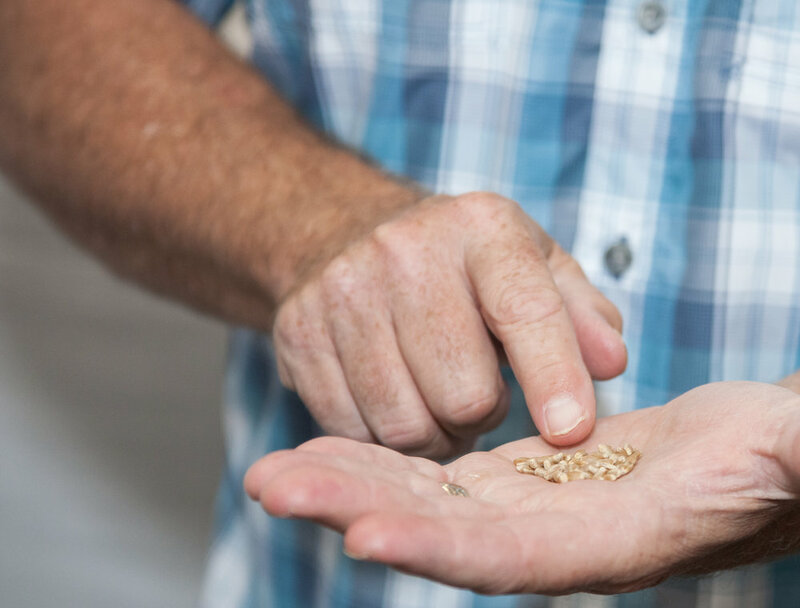 We test every varietal of wheat used in our products for flavor and suitability to our soils, not just for yield or protein—the primary measure of quality in commodity grains. For example, our Organic Expresso flour is known to have terrific disease resistance, which is especially important in wetter climates such as ours. It also produces a dark, rich crust and a rustic, earthy crumb that is so useful in hearth loaves—it’s become our standard bearer for Organic Bread Flour. Another varietal with tremendous flavor, color and resilience is our Skagit 1109 flour, bred naturally by our neighboring Skagit County-based WSU Bread Lab to thrive in local soils. Buy directly from farmers committed to soil health. Most of our farmers come out of our personal network; so personal they even casually swing by the mill for coffee and a piece of toast. These are friends we trust—we know their reputation as people. Our farmers are contractually prohibited from using glyphosate as a harvest aid, and from using neonicotinoid-coated seeds due to their documented harmful effects on humans, pollinators, and wildlife. We also pay our farmers a premium over the prices they get in the commodity markets because we want to ensure they are more than fairly compensated for the superior product they grow for us. Commit to completely-traceable, identity-preserved grains. We store our wheat locally in small-scale grain silos. Each varietal is stored separately, and our wheat is never blended with commodity wheat or any other wheat we didn’t buy directly from the grower. This commitment to identity preservation and traceability does come with tradeoffs. Whatever we take off the fields at harvest time needs to sustain our customers until the following harvest. If we get a spike in demand, we can’t call a commodity grain broker to replenish our silos. But we believe this is a worthwhile tradeoff because it is core to the unique flavors and quality baked goods, we are able to generate with our flours. We use stone mills, rather than just relying on technology that is standard for industrial flour mills. Stone-milling requires more attention and craft and our customers tell us it creates a flour with superior texture. In addition, all our flours preserve more of the bran and the germ. The germ is particularly important, because it is where many of the nutrients, antioxidants, oils and flavors are stored. Industrial mills remove this germ in order to create a shelf-stable product. Although it reduces shelf life, we preserve this germ to retain its nutritional advantages. Our flours are not artificially enriched. We don’t add dough stabilizers or conditioners such as enzymes, thiamine mononitrate, or malted barley.